The Province of British Columbia first introduced energy efficiency as a BC Building Code objective in 2008. Ever since, designers and builders have had the option to use either “prescriptive” or “performance” approaches to comply with the code’s efficiency requirements. To date, the vast majority of builders in British Columbia have pursued the prescriptive approach. Following this approach, buildings must meet specific requirements for insulation, windows, furnaces, water heaters, lighting and other equipment and systems. It focuses on individual elements, rather than ensuring the building functions well as a system. The result can be a building that does not perform as well as intended. Builders have a second option to comply with the energy-efficiency requirements of the BC Building Code: the performance approach. The BC Energy Step Code offers a specific form of this approach. The performance approach establishes a desired outcome, and leaves it to the design and building team to decide how to achieve it. To comply with the BC Energy Step Code, builders must use energy software modelling and on-site testing to demonstrate that both their design and the constructed building meet the requirements of the standard. They may use any materials or construction methods to do so. This approach echoes that taken by many green-building certification programs, including Natural Resources Canada’s Energy Star for New Homes™ and R-2000™ programs, and Passive House Institute (in Darmstadt) certification, as well as the Canadian Home Building Association’s Net Zero Home™ and Net Zero Ready Home™ programs. As shown below, the regulation sets performance targets for new construction and groups them into “steps” that apply across various building types and regions of the province. The Lower Steps are relatively straightforward to meet; the Upper Steps are more ambitious. All authorities having jurisdiction over the BC Building Code—including local governments—can choose to require or incentivize builders to meet one or more steps of the BC Energy Step Code as an alternative to the code’s prescriptive requirements. For governments, the BC Energy Step Code offers assurance that new buildings are performing as billed. Meanwhile, on the other side of the counter, builders have a more flexible option to comply with the energy-efficiency provisions of the provincial legislation. The new standard empowers builders to pursue innovative, creative, cost-effective solutions—and allows them to incorporate leading-edge technologies as they come available. Local governments can choose to require or incentivize a given step of the BC Energy Step Code in new construction. In addition, beyond the regulatory context, builders and developers can adopt a given step to use across all of their projects, if they wish. The diagrams below show what the performance improvements look like for simple buildings (those covered under Part 9 of the BC Building Code) and more complex buildings (covered by Part 3 of the code). 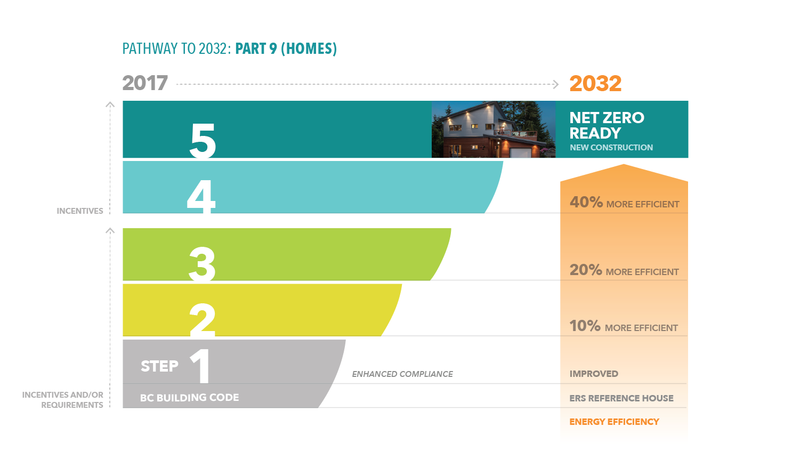 The first diagram outlines five steps from the current BC Building Code requirements to net-zero energy ready requirements for Part 9 residential buildings. As shown in the second diagram, the same progression for Part 3, wood-frame residential buildings is four steps. Over time, as high-performance designs, materials, and systems become increasingly available and cost-effective, the building industry will integrate new techniques into all new buildings. 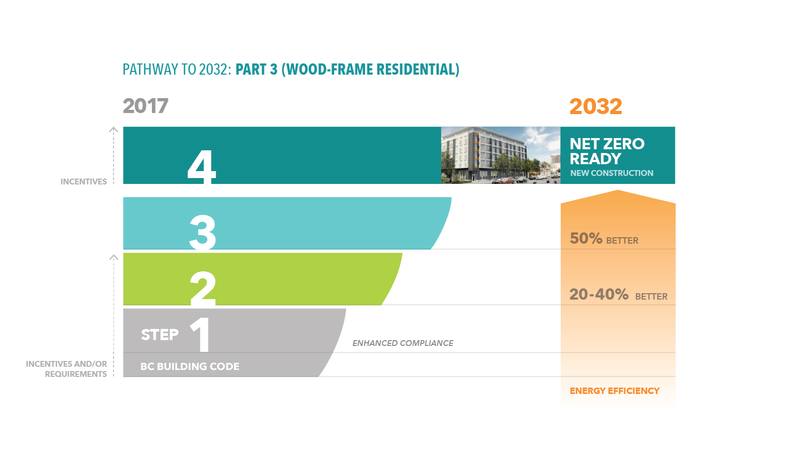 By 2032, the BC Building Code will move toward the higher steps of the BC Energy Step Code as a minimum requirement. The National Building Code of Canada is similarly moving towards this outcome by 2030.